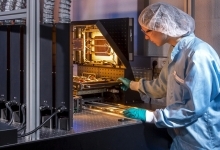 About 80% of the current global production of solar cells are based on multi- and monocrystalline silicon wafers and a relatively simple fabrication process that utilizes screen-printed metal contacts. 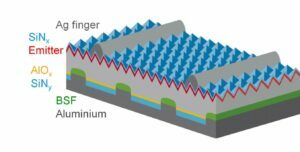 However, the aluminum that is printed on the entire rear side of the solar cells reacts with the silicon wafer during contact firing, resulting in the formation of an aluminum back surface field (BSF), which limits solar cell efficiency to 18% to 20%. As a result, manufacturers all over the world have begun to convert their production lines to the “Passivated Emitter and Rear Cell” concept. This concept features only local aluminum contacts whereas most of the solar cell rear side is coated with a dielectric layer such as AlOx/SiN. This increases the typical energy conversion efficiency to 20% to 22%. 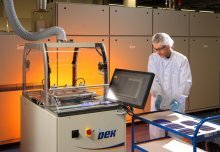 The group “Industrial solar cells” has implemented an industrial-like PERC reference process for 156 x 156 mm2 wafers in ISFH’s technology center SolarTeC that yields efficiencies up to 21.5% with a narrow distribution of ±0.15%. The SolarTeC houses production tools that are typical for industrial manufacturing of PERC solar cells. Based on this industrial-like reference process, the group works on improving specific processing steps in order to increase efficiency while maintaining – or lowering – costs. These developments are carried out in close collaboration with equipment manufacturers as well as material and solar cell suppliers. This enables a fast transfer of new processes into production lines. 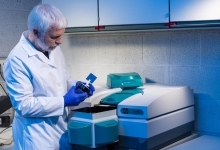 In addition, the PERC reference process is available for services. The contacts on the front side of solar cells are typically formed by screen-printing of silver pastes. 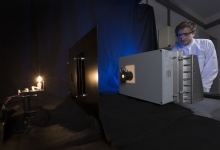 Our group focuses on reducing the finger width in order to reduce shading losses – and thus increase efficiency – and at the same time reduce silver consumption. This is done by improving the standard screen-printing process as well as optimizing print-on-print and stencil printing to achieve fingers widths below 30 μm. With regard to solar cell efficiency, it is beneficial to use different doping concentrations in the current collecting emitter at the front side of the solar cell. This way, a good contact between metal and silicon may be achieved while at the same time recombination in the area between the fingers can be minimized. The group “Industrial solar cells” evaluates different techniques to fabricate these selective emitters and applies them to the PERC reference process. 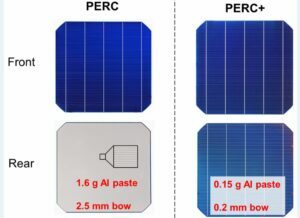 Current industrial PERC solar cells have a full-area aluminum print on the rear side. In contrast, ISFH has developed the PERC+ solar cell, which uses an aluminum finger grid on the rear side that is aligned to the laser contact openings. The Al grid enables bifacial applications in which light is absorbed on the rear as well as the front side. In combination with suitable installation, this bifaciality can increase the yield by 5% to 10%. In addition, using an Al grid reduces Al paste consumption and improves the electrical contact between Al and Si wafer. We are collaborating with various partners from industry to refine processing steps and help to implement the PERC+ concept into manufacturing lines.